Swim in the calm lagoon, relax on the beach, and enjoy water sports, A grilled lunch and soft drink is included refreshing tropical drinks or just do nothing but watch the coconut palms sway as you lounge in a double hammock. 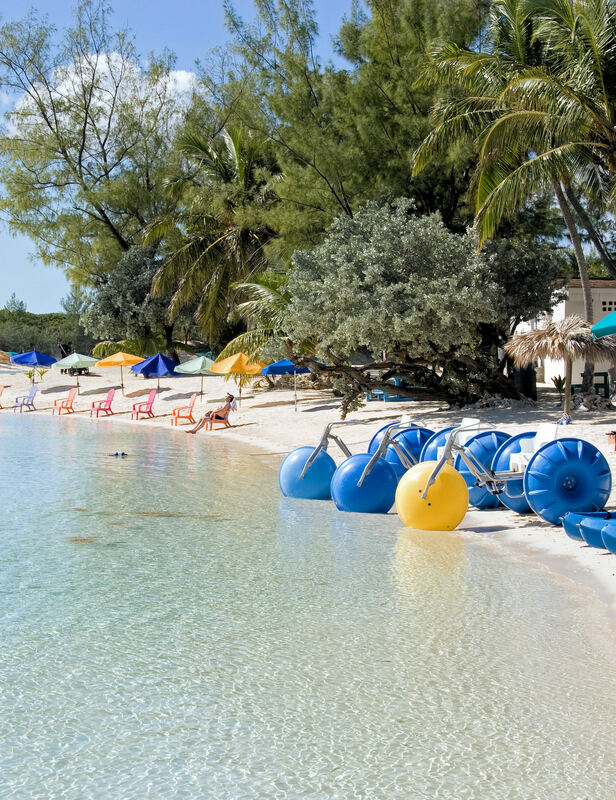 Enjoy beautiful Blue Lagoon Beach, one of the most well-known of Nassau's natural attractions. At your leisure, we have volleyball, soccer, and a gaming area and the most beautiful lagoon you have ever seen! In addition, kayaks, water bikes, canoes and snorkeling equipment can be rented on Blue Lagoon Island. Whether you want to lie in a hammock, swim in the lagoon, enjoy land and water sports, have lunch or purchase a refreshing cocktail at our Lagoon Tropical Bar, there are plenty of activities for the whole family to enjoy. Please note: Due to the sandy terrain, this tour is not well suited for wheelchair guests. The beach closes at 4:00pm. Grilled lunch choice of Angus burger or, hot dog, veggie burger or chicken burger with chips, fruit and a drink. Choice of one: 8oz. Angus Burger/Cheeseburger, Chicken Burger, 1/4 lb all beef hot dogs, Veggie burger. Choice of 1 cup of lemonade, unsweetened or sweetened iced tea or fruit punch per person. Volleyball and Soccer, and Entrance into both the Aqua & Tropical Bounce Parks, Picnic Tables and Beach Chairs, Double Hammocks and Use of Lagoon and Lagoon Beaches. You'll want to bring sunscreen, swimsuits, and beach towels for your day at the beach. There is a gift shop, changing rooms/restrooms and shower facilities on the island. You may purchase a refreshing cocktail. Kayaks, water bikes, canoes and snorkeling equipment is available for rent on Blue Lagoon Island. Approximate cost of the taxi to the tour departure area is $5.00 per person and is about a ten to fifteen minute ride depending on the traffic. Please note the beach closes daily at 4:00 PM. Guests age 3 or younger participate for free if accompanied by a responsible, paying adult with a ticket. For boating purposes, motorized power chairs and noncollapsible wheelchairs are not allowed on our boats. This is a bottle free zone, no food & beverage items to be brought in. You will need to take a five to ten minute taxi ride to the ferry landing. Please arrive at the ferry thirty minutes prior to your scheduled tour time. Additional information will be listed in your confirmation email and ticket for this shore excursion. See the "Redemption and Voucher Details" section below.